... except that this is one of the best flute albums ever recorded and fully endorses my own (and many others’ view) that Tansey, when he’s not off with the seagulls spouting atavistic nonsense or using his flute as a conversational exclamation mark or writing offensive letters to accordionists from Killorglin, is one of the best damned flute players of the last fifty years. Typically, King of the Concert Flute’s twelve tracks almost entirely consist of reels and jigs. Indeed a cursory glance at his other releases proves that the hornpipe is not exactly a major element in his repertoire. The two exceptions are The Lament for the Battle of Aughrim and The Dear Irish Boy which once again prove that Séamus remains one of the masters of air playing, his lyrical eloquence sustained by beautiful control and tempered by flourishes of ornamentation which never detract from the melody. Charlie Lennon’s accompaniment on both airs is thoroughly sparse and utterly fitting and throughout the album he fulfils the backing role in exemplary fashion. On jigs such as Michael Coleman’s and Up Sligo his bouncy chords reinforce the rolling rhythmic quality of Séamus’s flute while the pair provide the ultimate rendition of Martin Wynne’s No. 1 and No. 2 reels, a spirited, but ever measured tour de force. 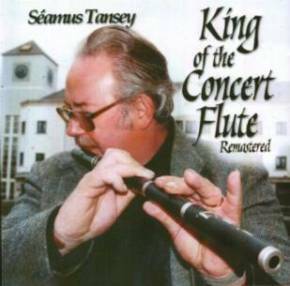 That being said, there is the occasional dissonance (as on The Gold Ring), but King of the Concert Flute demands to be heard for its merits and not ignored by young musicians who have come to dismiss Tansey because of his personal reputation.